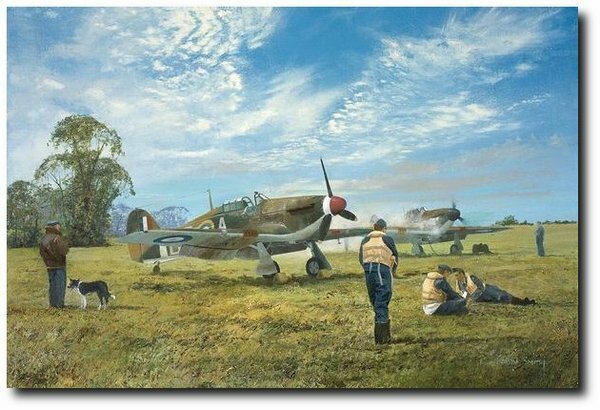 Painted as a commission, the image reflects the all too rare moment of relaxation for the aircrew on a fighter base during WWII. The aircraft featured of course is that of Bob Stanford Tuck of 257 Sqn. based at RAF Coltishall. Tuck’s first taste of victory was on 23rd. May 1940 when he actually shot down three German fighters. The next day adding to his score another two bombers. On 28th. Feb. 1942 Tuck was shot down by anti aircraft fire and taken capture. At the time of his capture, he had shot down 37 enemy aircraft.